Not all old techniques should be jettisoned for new technologies. 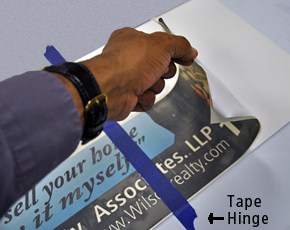 In the sign industry, old techniques like using tape hinges and application tape can be used with the modern technology of digital printing. Even the most advanced, demanding digital application can be simplified by old school approaches. Renowned “Speed wrapper” Justin Pate installs vehicle wraps in half the time of most other professional wrap installers. One of his secrets is the use of a hinge method to apply panels more quickly. If it works for Justin, it can work for you. If you’re new to the biz, you may be wondering what the heck is a “hinge method”? Simply put, a hinge is a narrow piece of application tape like Main blue painters tape that is used to attach a vinyl graphic to the substrate during installation. A vertical hinge bisects the graphic from top to bottom dividing it into two sections (Fig 1). Using the hinge to secure the panel, you raise one side, peel back and cut away the release liner, then squeegee that side to the substrate. Now that half the graphic is applied to the substrate, you can remove the hinge, remove the other half of the liner and squeegee the rest of the graphic. For a video demonstration of this technique with several options, please view our Basic Vinyl Application Video on SignWarehouse TV. Vinyl Graphics: Modern Problems, Old School Solution. • Bubbles. Applying a two by three foot sheet of vinyl dry without bubbles can be a challenge. The film must be applied carefully to get a smooth installation. This means maintaining a good grip on the vinyl as it’s laid down. That can also lead to stretching as the film is handled. Of course you can spring for a film with an air egress liner, but these tend to cost 50% more on average. More on that later. • Stretching: A 3 mil film with air egress will solve the bubble problem, but not necessarily the stretching problem. It’s still possible to overstretch or deform the vinyl as you apply it. You can opt for a six mil vinyl like PrismJET 222 with more body. The thicker face stock reduces the risk of stretching, but will not address the bubble issue or the abrasion problem. “What abrasion problem” you ask? Keep reading. • Abrasion: Applying an unmasked, unlaminated freshly printed vinyl graphic, even with a felt squeegee, raises the risk of scratching the print; especially if you’re pressing harder to push bubbles out through the air egress channels. So how do hinges and transfer tape solve these problems? Simply put, adding a layer of application tape gives your vinyl print abrasion resistance and body. The added thickness gives the print more stability and makes it easier to control it as you lay and squeegee it down on the substrate, which makes it easier to achieve a smooth, bubble-free installation. The extra heft also gives a three mil vinyl the body and stretch resistance of a six mil film and prevents stretching or deformation of the vinyl. And finally, since the force of your squeegee is being applied to the tape instead of the printed face film, you can apply it without worrying about scratching the print. Applying the vinyl graphic with a wet method allows you to align the graphic easily. Wet methods are not recommended for water soluble adhesives. Using application tape and hinges can be done wet or dry. If you’re using a vinyl with an acrylic adhesive, it’s best to apply it dry. Acrylic adhesives are water-based and tend to take much longer to wet out or bond to the substrate if exposed to application fluids. A vinyl with a solvent adhesive won’t do this. If you’re applying something that requires precise placement, you may want to use the fluid to position the vinyl precisely before removing the tape. 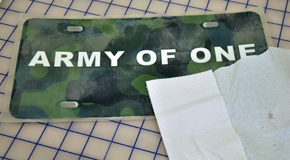 This was the case with our Army of One license plate blank, printed with the PrismJET DT. I used a wet application to be able to align the vinyl so there would be a uniform bleed around the bolt holes. You generally don’t need, tape, and a hinge if you use application fluid. But on a very large graphic, it might make it a little easier to remove the tape if you’re only doing it in sections. But whichever vinyl you choose, if you do opt for application fluid, use it sparingly. Here are the steps. • Print and cut the vinyl. Apply the premask; In this case, I used a clear tape to allow me see more clearly to align the vinyl over the bolt holes. • Remove the release liner and carefully set the masked graphic aside, upside down of course. • Apply a very thin mist of application fluid to the substrate. Don’t saturate the surface or you may have problems with the fluid causing the tape’s adhesive to delaminate. Run your finger across the substrate to spread the fluid evenly so you have a thin layer of fluid that will let you reposition the vinyl. • Place the masked vinyl on the substrate and move it to the desired position. Once the vinyl is positioned properly, squeegee firmly to push all the fluid out from under the vinyl. Soak it up quickly with a paper towel so it doesn’t pool under the vinyl or tape. • Wait a few minutes for the adhesive to set, then slowly remove the application tape. Dry Application with App Tape and Hinge. For large simple graphics, a dry application and hinge works best. This was the method I used for the real estate sign which was also printed with the PrismJET DT. This one was tiled so the vinyl was applied in sections. 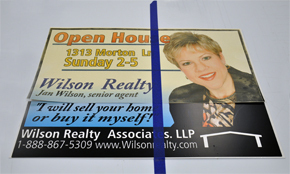 The tape and hinges made it easy to align the tiles and apply them for a flat bubble free printed real estate sign. Here are the steps. • Print and cut the graphic. Apply the premask smoothly taking care to avoid wrinkling the tape as it’s lain down on the vinyl. • Leaving the release liner on , position the vinyl on the substrate, taking care to measure and align it properly. When it’s positioned correctly, apply a hinge using Main Blue painter’s tape or something similar, to affix the graphic in place. Your hinge should secure the substrate and the vinyl to the table if possible. Make sure you can apply the vinyl without the substrate shifting underneath as you work. • With the masked vinyl print secured, lift one side of the vinyl away from the substrate and remove the release liner. Peel the masked vinyl and lay it back down on the other half of the graphic. • Using scissors, a utility or Xacto knife, cut away the exposed half of the release liner. Take a moment to make sure you still have a clean dry surface. Bits of dust or release liner fragments left behind can cause ‘bubbles” under your print. • Raise the half with exposed adhesive and carefully lay it down on the surface, working with your squeegee to get a smooth, bubble and wrinkle-free application. Work from the center hinge outward. Save the section of release liner you cut away for burnishing. • Then lift the other half, remove the remaining release liner and repeat the process. When both sides are secured, remove the application tape. You may want to use the release liner at this stage to re-squeegee the print. You can lay it on the surface to protect the ink from abrasion so you can apply adequate pressure to help wet out the adhesive and get a good bond. I mentioned above that using application tape and a hinge allows you to work with basic calendared vinyls that don’t have an air egress liner. But doesn’t adding application tape cost as much as just buying a roll of vinyl with an air egress liner? Usuallynot. Some vinyls are pricier than other of course, but comparing the cost of a standard printable vinyl plus application tape to that of a comparable film with an air egress formula reveals that the old method is also more economical. • A 48” by 50 yard roll of PrismJET 203 costs $136.00. A 48” X 100 yard roll of EnduraMASK High Tack tape: $103.17. Since we’re only using half the roll to cover 50 yards of vinyl, the total material cost is only $187.59. A 48” x 50 yd roll of PrismJET 230 Ultra-an ultra calendared vinyl with an air egress liner- cost $369.00. There are other benefits to PrismJET Ultra. It’s excellent choice for vehicle wraps. But for standard signage on flat surfaces, it might be overkill. Paying $182.00 more just for air egress doesn’t always makes sense. • The same is true in the ORAJET camp. A 60” x 50 yard roll of 3640 economy vinyl costs $138.00. Adding fifty yards of 60” DigiWrap Tape adds $86.91 for a total material cost of $217.30. Opting for a 60” roll of ORAJET 3165RA costs $270.80. So the air egress option adds $42.00 and doesn’t offer the built-in abrasion resistance of applying your prints pre-masked. I’m not saying you shouldn’t use vinyls with air egress liners. They can be very handy and make large installations much easier. I’m only offering an alternative application method for those situations in which you want to use a standard calendared vinyl or there simply isn’t an air egress vinyl available with the properties you need. Whether you’re using a PrismJET DT or a 64” ValueJet, these methods can help you get clean installations on good basic digitally printed vinyl. Old techniques can enhance our use of new technologies. Don’t toss your app tape.